I actually write here occasionally. Not as often as I should, but sometimes. My homepage's old home. Lots of tripe that should be moved to this server, but is still on Tripod. This is my old Castle of the Winds website. It's poorly maintained, but has a fair bit of information, plus various things to download. I've finally gotten around to collecting some of my poetry on one page. It's not good. It's not meant to be good. Here's at least some of what I've written for National Novel Writing Month. 2006 was my first successful attempt. I have a blog. Sometimes I post there. Usually not. I have a Facebook account. But Facebook is evil, so maybe I shouldn't. I like to tweet things of variable interestingness. I don't post YouTube videos, but I do occasionally favorite good videos that other people kindly uploaded. I used to use 43 Things. Mostly I tagged a lot of things. Like, a lot lot. I visibly manipulated the front page tag cloud. I use Google Reader a lot. Mostly to read stuff, but sometimes I click the 'Share' button. I have a profile on Blogger. It links to my blogs on Blogger. I edit Wikipedia in dozen of languages, but most of my user pages are gone, it seems. The English one persists. I haven't done as much Wiktionary as I'd like, but I have a userpage. I don't really use Linked In, but I have a profile and a few connections. Goodreads is better than AllConsuming. I try to keep both up-to-date, but this is what I actually care about nowadays. I used to use E2 (and E1) a lot. Now I don't much. But a minority of what I wrote persists. I posted some pictures on Flickr. But now I'm moving toward Panaramio because their geotagged photos get used by Google Maps, and that's cool. I fund many Kiva loans. You should too. I have a Google profile. It mostly links to other profiles. Kind of like right here. Sometimes I make animated gifs. Usually Nerdfighter-related. I'm a Tumblpoo, or whatever the term is. I use Github for some things. I'm still too lazy to make this a well designed site with good content and such. It's just a dumping ground. But some of the dumped stuff is worth of websiteness. A bunch of utilities, some tripe, and links to actual content on the left. Briefly disables the 'Post!' and 'Send!' buttons upon clicking to prevent double-clicking resulting in double-posting. A Greasemonkey script to convert eCritters' Recently Online to the old version. A Greasemonkey script to highlight/hide eCritters' forum topics by specified users. Greasemonkey script to add checkbox deleting of eCritters' eeMail. Add a 'Tag as [something]' link next to the names of items on the search. Lets you choose which map you want for the Human Settlement on eCritters. Allows you to view all public eC forums from a single page. Search for topics by a given user. Search for topics posted on/by a given user. Greasemonkey script to add a preview option when posting replies. See what colour a username would be on eCritters. See approximate cost of (mostly) food items in Austin, TX. Most data from 2008 and 2010. The Menorah drawn by Kannya, possibly modified by Wesc. 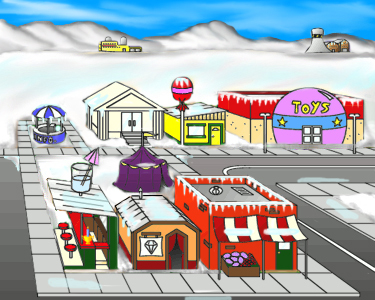 The Winter Settlement Map. This is Anima's modification of Macdougs' Settlement Map. It's possibly been modified by others, as well. A very short-lived item on eCritters. The art is just Zaumbe's Kelpie. Foobar2000 is the best music player for MS Windows. This is the most popular add-on UI for it. Just drop in in the components folder. Why is this here? Well, apparently the people who made it think we all want to install yet another proprietary, graphical decompression application on our computers just for this. We don't. Yes, 7-Zips get great compression, but unless I start downloading a lot of big 7Zed files, this one-time 70KiB gain over bzip2 won't outweigh the 800KB software download or the inconvenience of a crappy GUI. Foobar2000 is the best music player for MS Windows. This is the most popular add-on UI for it. Just unbzip2 drop in in the components folder. YES, THAT'S RIGHT, I SAID UNBZIP2. IT'S IN CYGWIN, UNLIKE 7ZIP. Guess which should therefore be considered obscure.